Send Chocolaty n Crunchy Treat to Chennai. Gifts to Chennai. Send Sweets to Chennai. 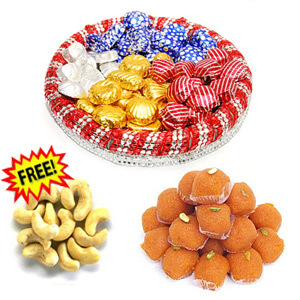 Description : Can anything be more enthralling than this mouth-watering gift hamper. This exclusive gift hamper will be a perfect gift for this New Year. A beautifully decorated handmade thali full of 500 gm assorted handmade chocolates and 500 gm motichur laddu will be delivered with 100 gm salted kaju ABSOLUTELY FREE. Let your loved ones enjoy a mouthful of experience by sending this Chocolaty n Crunchy Treat as your New Year gifts to Chennai. Pair this mouthful hamper with other exciting Gifts to Chennai and send through Gift2Chennai.com.